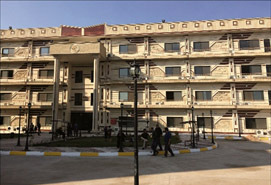 The completion of the design of the five-story educational dental hospital with an area of 6000 square meters and which returns to the department of dentistry at the college of Degla University in Baghdad. The contract included conducting the preliminary study and preparing the integrated designs including architectural, construction, electrical services and systems works as well as preparation and submission of the project management requirements from the schedules of quantities and programs of work. The works of the study of quality inspection quantities survey and estimating the costs of the college complex of Degla University in Baghdad. The land area of 7 acres and the building area of 31400 m2 square meters includes several building height (3-5) storeys and the cost is 25$ million dollars.